This Rhubarb Vodka has a delightfully smooth mouthfeel and delicate sweet bouquet reminiscent of Summer and fresh picked Rhubarb. Tasting Notes: Sweet rhubarb dominates the nose and coats the palate with a balance of sweetness, with hints of fresh vegetables and basil. J.J. Whitley follows a tradition born of eight generations of distillers and our range of spirits are inspired by the flavours of English gardens and hedgerows. The Whitley family were well-known for cultivating their gardens and searching the hedgerows for thrilling new flavours, indigenous to the countryside. As a child, J.J. Whitley would have spent much of his time in the gardens, playing and helping the family harvest ingredients like home-grown seasonal rhubarb, which would be used for cooking, baking, and distilling spirits, like this Rhubarb Vodka, made with natural rhubarb flavouring. 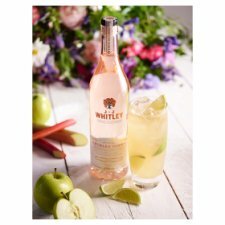 Perfect serve: 50ml J.J. Whitley Rhubarb Vodka, 50ml cloudy apple juice, 50ml Ginger Beer, 1 lime wedge. Fill a highball glass with cubed ice. Simply add JJ Rhubarb Vodka, cloudy apple and ginger beer and give a quick stir. Squeeze a lime wedge on top and enjoy.